You’ll recall the shooting at the Regency Hotel in Drumcondra, Dublin on Friday afternoon during the weigh-in for the WBO European Lightweight title fight between Jamie Kavanagh and Antonio Jao Bento. David Byrne, 33, from Crumlin, south Dublin was killed in the shooting while another two men were seriously injured. Following the shooting, photographs of the gunmen appeared in Independent News and Media titles over the weekend. 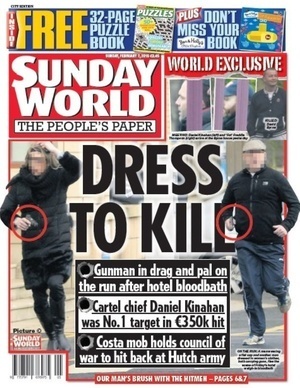 Special Correspondent at Irish Independent, Paul Williams, and Michael O’Toole, crime correspondent with the Irish Daily Star, spoke on Today with Seán O’Rourke this morning. 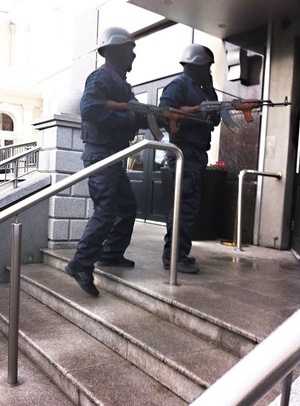 Mr Williams told the show that it was fortuitous that no undercover gardaí were present at the hotel because, if they had been present, a bloody shoot-out was likely to have occurred. He also explained that gardaí had called to the offices of INM with a warrant to try and stop their photographs from being published. 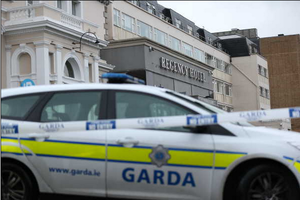 Posted in Misc and tagged INM pictures, regency hotel, shooting at 12:01 pm on February 8, 2016 by Broadsheet. 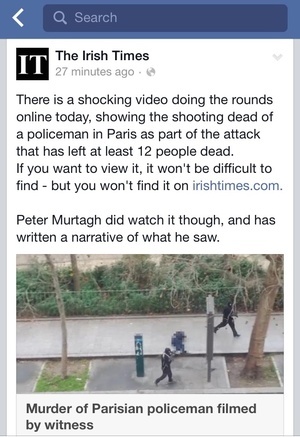 Talk is the garda didn’t show up because there was a “feeling” this was going to happen. Perhaps they allowed it to happen as a pre election bargaining tool..
Ok maybe I’ve watched the wire too many times. I don’t believe the gardai are that naive to think there would be no persons of interest at that weigh in. I imagine that the Gardaí figured that there would be lots of criminals there, but that there would also be loads of cameras, which would put off potential assassins (though evidently it didn’t put them off too much). So who took that first photo of the two entering the hotel? It’s very near and very clear so how come the photographer was confronted by the two or even shot? Was thinking that myself, fairly courageous risk for journalism. It’s a security still no? Taken by an Indo sports photographer. Sunday Word and Indo were in stake out vehicles hoping to get photos of well known crims. The cops more than likely DID know and the fact that they weren’t there is highly suspicious. Or were they there but just didn’t show themselves. Lots of questions to asked about this. Lads, this is all shady as feck. Fining cyclists 40 euro for minor offences while this happens. Cyclists should clearly get a free pass from breaking lights constantly while drug wars last, clearly. I stop at lights so your madey uppy anecdotal comment is just poo, following your “logic”. go back to bed? Then you won’t get fined 40 euros. 40 euro fine for cycling down an empty lane on the side in the incorrect direction. He was just sitting there on his bike. So he was sitting there doing that while I’m sure much more important things could be dealt with. It wasn’t me by the way, it was someone I know. I hate cycling. Question: why are the perps faces blurred? because they have not been convicted of a crime? Id imagine it was some trade off with, or instruction from, the guards – didnt willums say the guards had some warrant to stop them publishing it. Everyone is entitled to a fair trial and one could, in theory, claim that a photo of you appearing to commit the crime would affected your ability to be tried without prejudice. It makes more sense in cases other than this but you have to apply the same law to everyone. It could prejudice the any jurors to the potential trial, and could in theory allow them to get off scott-free. They are caring guns down a street in broad daylight. No one is allowed do that. yep that bit isn’t clear to me atall excuse the pun…why indeed? what possible advantage is there in hiding the identity of the scumbags? Guy on radio earlier said it was to prevent them being identified to t’other gang and for them getting to them before the guards do. High moral ground from rag that *barely* stopped short of giving away replica gimp masks during coverage of Dwyer trial. BBC has reportedly received a claim from Dissident CIRA that they carried out the hit but they can’t verify the password used. So it’s probably not true. But Fine Gael will use that to undermine Sinn Fein even though they would be targets of CIRA who oppose Sinn Fein for joining the Peace Process. But the idiots can’t tell the difference and Fine Gael will use that. You know that’s what they’ll do. Mislead the public. Just like Chicago in the 1920’s, Northern Mexico today, mindless gangsters killing each other over trading territory. We don’t see bar owners or beer suppliers taking pot-shots at each other today. All the current demand for narcotics is met by the criminal class, they operate in a behavioral sink, this type of event will become more common due to the defective personalities that are involved if their power is not curtailed. Every Effd up heroin addict doesn’t care about the law, casual hash tokers don’t care about the law, hot-shot cocaine snorting solicitors and estate agents don’t care about the law, the fact that supply and possession of narcotics is illegal gives these violent vermin their power. Those aren’t AKs either, what with the handle at the front. Probably cheap Eastern Europe stuff. Simple, nobody wants to get shot. Let them kill each other. It’s better when they stick to doing it at night or outside of the country. Doesn’t get on English news that way. And as we know paddy politician doesn’t like the neighbours talking. @TK ickle, looks like a PM md. 65 rifle to me. If the gardai really didn’t know anything about this, (which seems doubtful) surely the gardai are either incapable, incompetent and/or negligent? Or all of the above? Doesn’t increase the confidence I’d have in garda assurances that they are monitoring other threats or their ability to identity who is coming into this country.